>>1/2/3/4/5/6/8/10/12/16 passageway Pneumatic/Hydraulic rotary joints. >>can combine 1~128 wires electrical power/signal. >>Connection Size: M5, G1/8", G1/4", G3/8", G1/2"
>>Media Types: Air/Gas, Chemical, DI / Tap Water, Oil, Water/Glycol. 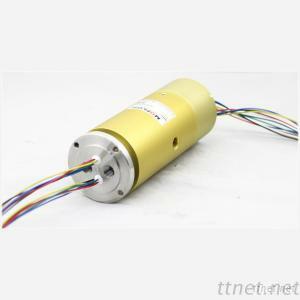 MEPH100 Rotary Joints, Support 1 passage way Pneumatic/Hydraulic, it can combine with power, signal, Ethernet, USB, Devicenet, Control Net, Canbus on request. It also could be mounted by shaft or optional flange mounting. Media Types: Air/Gas, Chemical, DI / Tap Water, Oil, Water/Glycol. 1> How many pass way? 2> What's the port size? M5, G1/8", G1/4", G3/8" or G1/2"? 3> What the air pressure? 5>How many wires you need? How many wire for power and how many for signal? 6>What's the current? 10A, 15A or other? Then, we will give you a solution or send you the engineer drawing data.